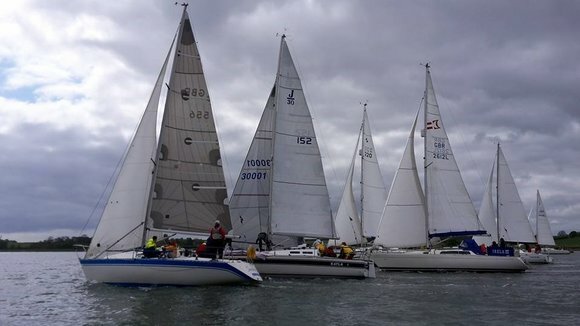 Interest in yacht racing at the club continues to grow, with 9 club boats competing in this year’s Combined Club series, 3 boats in the Haven Series, and 4 in Felixstowe Regatta. Several of these boats have also been active in the Haven Offshore and EAORA Offshore series. David Neville’s “Sea Shanty” will shortly be flying the club burgee at Cowes Week, and Simon Ruffles’ “Jameerah” will be following them down to the Solent for the Fastnet race. In the Combined Clubs Series, Ed Harrison’s “Alchemy” leads the overall standings after 3 races, with Pat York’s “Jester”, Will Finch’s “Time Off II”, and Sea Shanty all in the top 10. Overall RHYC is leading the inter-club trophy by a margin of more than 20 points at this stage, poised to break a half decade of dominance by Harwich and Dovercourt S.C. The Royal Harwich regatta is just over 2 weeks away, where yachts will compete for the Sphinx cup, which was originally awarded to the winner of the Royal Harwich Regatta in the 1860s. Starting from the Haven Ports line in a steady F3, Sea Shanty was the lead RHYC boat as both Alchemy and Time Off II were OCS and had to go back. Beating out of the harbour, Sea Shanty remained in the lead group, dicing with a J30 and Hustler 30 for position. The wind increased up to a F5, forcing many boats to make headsail changes before bearing away at Pye End. Taking advantage of the breezier conditions, Alchemy pulled ahead of Time Off II upwind, only to be overhauled again on the reach from Outer Ridge to Pennyhole, where the fleet set spinnakers to return to the HPYC line. Sea Shanty came home 4th, with Alchemy recovering to 7th and Jester just taking 10th from Time Off II. John Brooke’s Beneteau 21.7 “Fin” rounded out a strong RHYC finish, coming home 13th. Light airs greeted the 18 competitors for the second race, sponsored by Pin Mill Sailing Club, as the sea breeze struggled for supremacy against a light offshore wind. 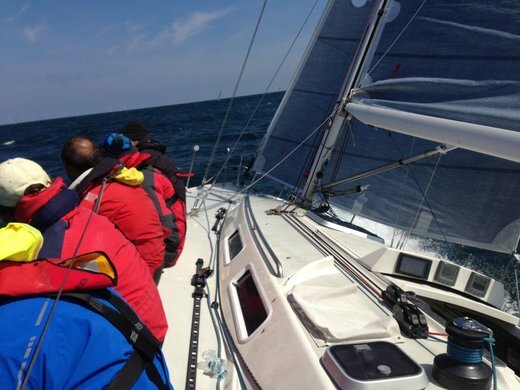 The fleet left the measured mile under spinnaker, but into the void between breezes off Shotley, where Jester, Alchemy, and Will Finch’s Bavaria 37 “Time Off II” were neck and neck. As the sea breeze filled in, the leaders found the wind first, with “Berlingo”, a mini transat from Stour Sailing Club, disappearing over the horizon. The race from there on was largely processional, with Alchemy coming home in 4th, Jester 6th, and Tom Dixon’s Sadler 32 “Sunrider” in 8th, making up for the loss of their spinnaker in race 1. The Combined Clubs season began with 19 boats from the six participating clubs assembling for the RHYC sponsored race. David Neville’s Maxi 1000 “Sea Shanty” was amongst the lead pack off the measured mile line, with 7 other RHYC boats in hot pursuit. Simon Ruffles’ J120 “Jameerah”, practicing with the fastnet crew, quickly stormed through the fleet as they reached through Harwich Harbour, but an increasing wind and foul tide beat down towards the naze allowed Ed Harrison’s Impala “Alchemy” to keep in touch with the faster boats, with the gap remaining relatively small as Jameerah led the fleet on the 10 mile run back to the RHYC club line. Overall, Alchemy topped the leaderboard, with Sea Shanty 2nd, and Pat York’s Dufour 32 “Jester” the 3rd RHYC finisher in 9th, giving the club an early lead in the inter-club points. If you would like to get involved please email Ed Harrison: spitway@hotmail.co.uk for more details.